1) Training by rewarding desirable behaviors so they will be more likely to occur in the future, while preventing reinforcement of behaviors that are undesirable. 2) Interrupting and preventing undesirable behaviors without physical or psychological intimidation, as well as rewarding an alternate response (training a behavior you find desirable in it’s place). 3) Taking an animal’s emotional state and stress levels into account. 4) Socializing and teaching an animal to cope with his environment using reinforcement. 5) Using a marker to train, whether it be a clicker, some other noise-maker, your voice or touch, or a visual marker. Or, on the other hand, not using a marker, and instead for example reinforcing an animal by feeding a treat directly to his mouth. 6) Employing humane, effective, respectful training based on the latest scientific evidence. It’s the non-aggression principle applied to dogs. Emily Larlham is an internationally renowned dog trainer and artist who resides in Malmö, Sweden. Emily combines her artistic background and training skills to come up with creative, fast and reliable ways of training and modifying behaviors. Her passion is using Progressive Reinforcement Training to solve behavior problems in dogs as well as teaching highly complex behaviors and tricks. 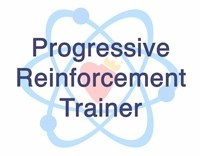 Emily created the term Progressive Reinforcement Training to describe a non-violent way of training animals that involves no forms of physical or psychological intimidation.